With the rise of 3D printing, there has been a surge in the popularity of firearms enthusiasts utilizing this amazing technology to manufacture their own guns. While it is definitely possible to print a gun out of metal, (it has been done several times already), the printers which allow for the use of metal tend to be a more expensive than the ones which create objects out of plastic – meaning more gun hobbyists are trying their hand at making firearms out of plastic than out of metal. What some of these hobbyists may not know is that plastic firearms can be very dangerous. As your chosen New Hampshire Gun Shop, we advise extreme caution on this issue. You don’t have to be a licensed NH gunsmith like we are to understand why firing a conventional ammo round in a firearm composed almost completely of questionable-quality plastic could be dangerous. It all comes down to the physics behind what happens every time you fire a shot. When the powder ignites to force the bullet out of the chamber, it is the barrel of the gun that absorbs all of the kinetic force released by the explosion. Notice how fast the bullet moves, and think about how much force that actually is. This is why guns are typically made of metal – as metal is strong enough to withstand the constant application of these high pressure scenarios. Plastic typically isn’t. A quick search on YouTube will pull up several videos of 3d printed firearms exploding while firing a conventional round of ammunition. Clearly, if the printed plastic gun craze is to continue, some other type of ammunition would be needed. Enter Michael Crumling, a 25-year old machinist from York, PA.
Crumling came up with a design for a bullet meant to be fired from 3d printed plastic firearms. 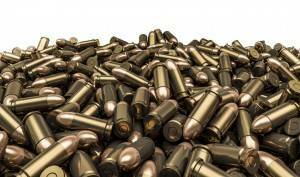 In it, the lead bullet is mounted an inch deep inside a slightly thicker steel shell. These two tweaks make all the difference because they allow the force of the powder’s ignition to be absorbed not by the barrel or other parts of the plastic gun, but by the stronger shell casing itself. Crumling has posted a video online of him firing several rounds continuously out of a plastic gun he printed himself – which survives the ordeal intact. Currently, however, he has no plans to make his ammunition commercially available, so in the meantime, you can still buy your favorite ammo for any of your firearms at the premier gun shop in NH: Old Glory Guns & Ammo!